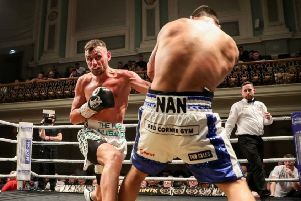 Tyrone McCullagh has set his sights on securing a shot at a world title by the end of 2019 as he prepares to return to action in Newcastle on May 3. Unbeaten McCullagh defends his WBO European super-bantamweight title against Spanish champion Alvaro Rodriguez on the #MTKFightNight bill at the Eagles Community Arena is live on iFL TV. And McCullagh hopes that a win can lead to bigger fights later this year. McCullagh told iFL TV: “I would jump at the chance to fight any of the world champions. “ I would love to get a shot at a world title by the end of 2019, so hopefully I can keep on winning. “I’m ranked number 13 with the WBO, so if I defend this belt successfully in Newcastle then hopefully I could be in the top 10 rankings, so that may be the right path to go down. “First I’ve got this fight with Rodriguez in Newcastle. I watched him fight Thomas Ward who is a class act, so I can use that as a benchmark. If I stick to my own game plan and box the way I know I can, then I should be alright on the night,” he added.